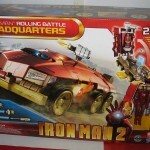 Toyshop88 has uploaded 2 new images of the upcoming Iron Man Rolling Battle Headquarters which should be released soon. Iron Man 2 premieres later this week in the US! 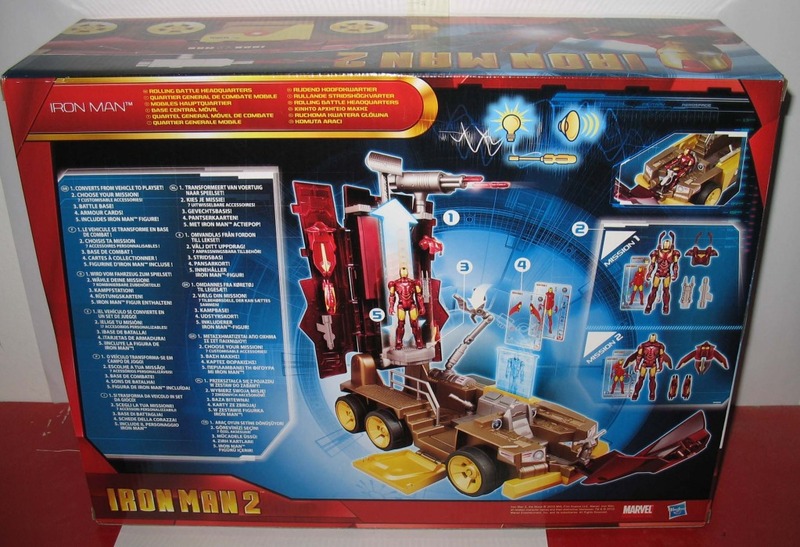 This vehicle has an MSRP of $34.99, and comes with an Iron Man Mark VI figure with swappable armor components. Could the extra pieces of armor be compatible with existing figures in the line? The Iron Man 2 Rolling Battle HQ features electronic lights and sounds, missle launchers, slots to store armor cards, and more! Click on the title bar to check it out! cool vehicle but I'm more interested in those armor upgrades...I mean are they only with the vehicle or will they come out separately later..very interesting. looks like the figure included is really downgraded in articulation even looks like the ball hip joints are gone and there's just a slice joint. 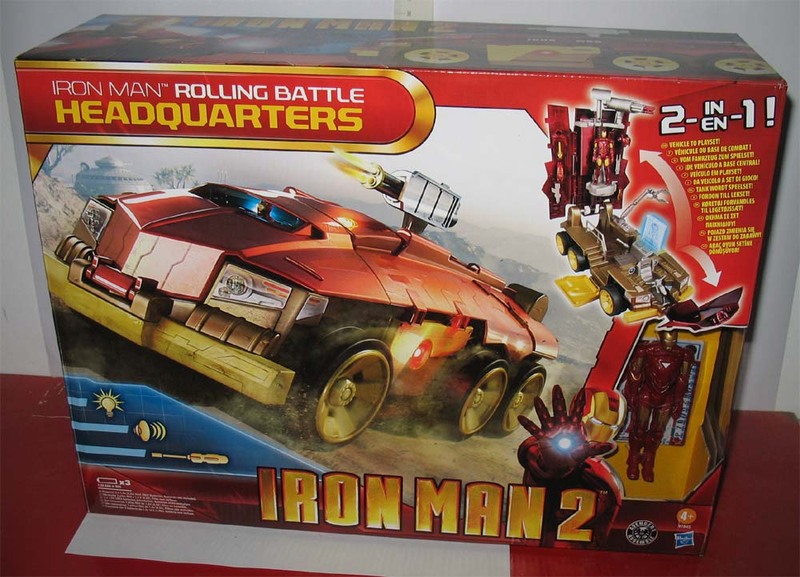 Why does Iron Man need a rolling headquarters? guess its like a mobile armor carrier, its a vehicle gimmick I mean they gave him a atv, race car...just toy tie-ins for more prophets. its a cool lookn vehicle though. Good point. I think in Hasbro's mentality, something that has Iron Man's armor colors is more appealing to kids than the one in the movie. Admittedly, I like your idea better though, that would be a fun car to play with, reminds me of the Galoob Crash Dummies toys. I am fighting the urge to yell, "If this Van's a rockin...". Anyway, this thing reminds me of Roller, the little car droid thing that fit into Optimus Prime's As...er...Trailer. Well, Roller on Steroids perhaps. I haven't bought anything Iron Man yet and this is going to be too tempting to pass up. I'm just a mark for rolling battle station truck things. 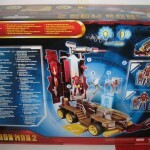 Any decals say "Stark Industries" in that box? because tony stark has narcissistic personality disorder. Cool. I want this for sure. I'm happy that it's only $35. I expected it to be around the $50 range. ...that would be a fun car to play with, reminds me of the Galoob Crash Dummies toys. What?!! I had some of those Crash Test Dummies toys. They were way cool. It should be pretty soon. Can that 5 dollar coupon be used for this? no idea haven't seen the figures that have those. Yes, I believe so. The coupons are for $5 off a $20 or more purchase for IM2 stuff. I think the armor is exclusive to the vehicle, though it wouldn't surprise me if they make it into later deluxe or regular figure packs. There's another less on here related to Hasbro's rampant hypocrisy when it comes to what vehicles they choose and their embargo against playsets. With Star Wars their party line has been to focus on vehicles that feature big in the films or TV series, while ignoring fan favorites. More specifically, year after year they claim that their "research" shows that kids don't like playsets and continue pass on reviving the Death Star playset. But it's okay to come up with a playset/vehicle that doesn't exist in any film--let alone a 6 film/TV franchise? !